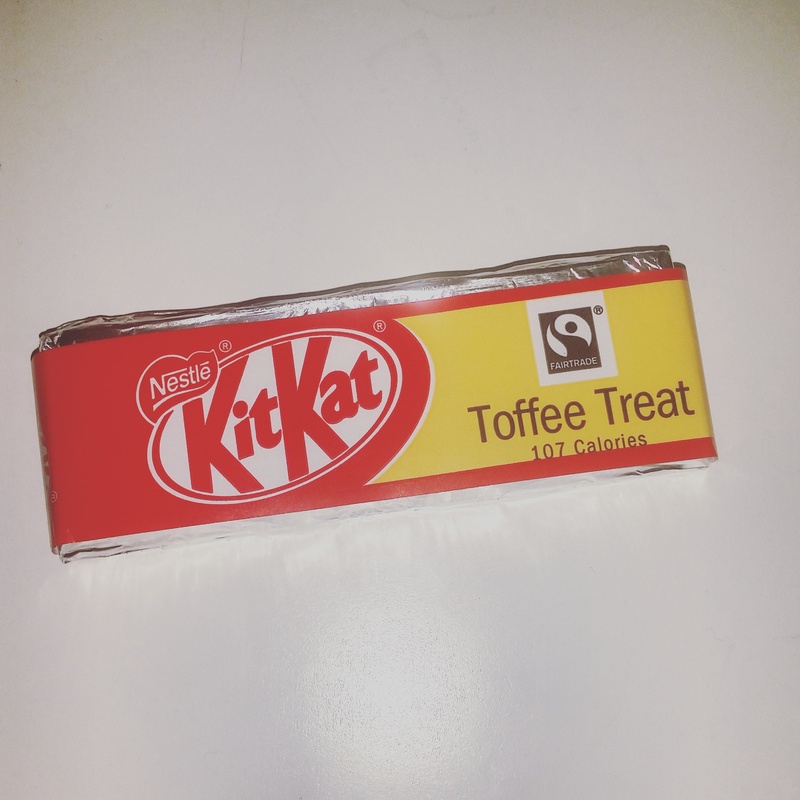 There is a chance that I have lived in a bubble recently and have become so unaware of anything branded or different to the norm that I was completely unaware of the introduction to the Kit Kat Toffee Treat (I have seen the adverts plastered everywhere for the Cookie Dough one but am still holding out for the Green Tea one to make a UK shelf showing). Available for £1.59 from Ocado we got them from a Pound shop for (unsurprisingly) £1. I suggested them for my partner to take to work with him as an emergency snack but as there are eight in a multipack I was able to try a couple of them. These are two bar Kit Kat’s rather than a four bar or a chunky one but they are a little sweeter than a normal one so no more than that is really needed. Each two finger bar is just over 100 calories so there is very little difference between the original and this one which helps to relieve any guilt that the extra sweetness of this bar might provide. The top of the bar is a lighter colour rather than the traditional milk chocolate and instead has a creamy appearance. This is clearly where the toffee flavour is stored and whilst that flavour is not how I recall toffee to traditionally be it is quite like a Muller Light toffee yoghurt. Whilst these are lovely and I would perhaps prefer one of these as a standalone snack I do not think I would enjoy it after having lunch regularly or with a hot drink whilst having a quiet moment. These are also something that having as a snack or part of the day for several days in a row could easily become very tiresome and from that I feel a traditional Kit Kat would probably be better to pop into a lunch box. These get four out of five compared to a normal Kit Kat but come it at a three and a half out of five for overall stand alone snack and a three out of five for a snack as part of lunch. Could be better but could certainly be far far worse. A nice treat but not one for everyday. 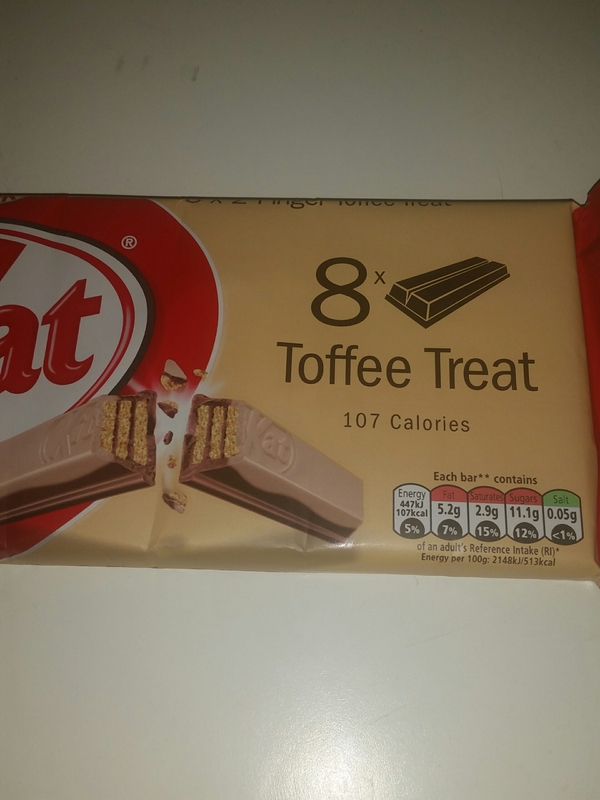 This entry was posted in Food and Drink, Product Reviews and tagged biscuit, brand, branded, chocolate, dessert, eat, eating, flavour, flavoured, food, Food and Drink, food blog, food blogger, food bloggers, kit kat, lunch, lunchbox, pudding, snack, taste, treat, wafer. Bookmark the permalink.